The Popsquinted Maloptachunk were a type of monkey raised for the royal courts of central Europe during the late middle ages. These monkeys were used by an officer of the court whose title was Der Popsquinted Maloptachunk (PM Rex), who carried the monkey with him everywhere on a golden leash. The office of PM Rex consolidated two previous offices: the Court Jester and the King’s Speaker. When the PM Rex addressed the people in the name of the king, his Popsquinted Maloptachunk monkey would scream hysterically and throw feces at the crowds if they questioned any point, no matter how brazen the lie. That’s the central belief of New and Improved Mormonism. You have to understand that New and Improved Mormons (NIMs) are just like other Christians in that they believe in Jesus Christ as the divine son of God and the savior of all mankind and that he was resurrected and all that. 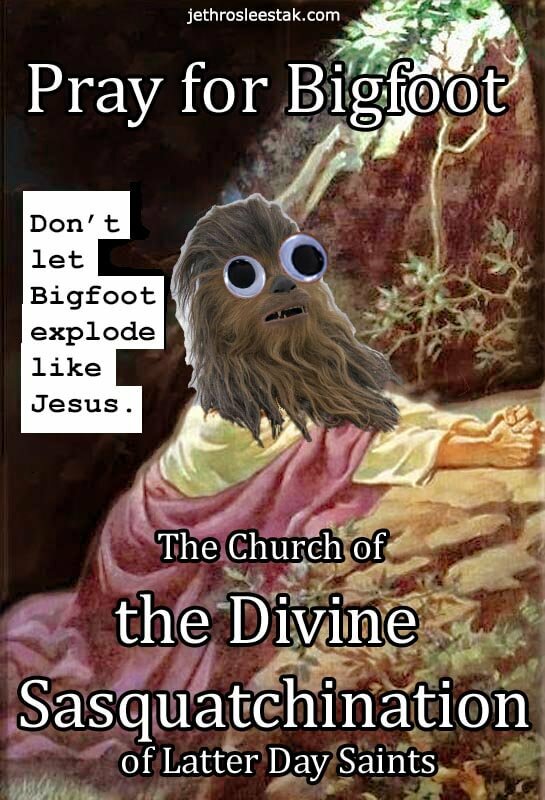 The difference is that NIMs also believe that the sins of the world became so great that Jesus exploded from the overload, and Bigfoot had to take over. They call that tragic event the Divine Sasquatchination and believe that it happened around the time of Donald Trump’s third medical deferment from military service during the Viet Nam war. 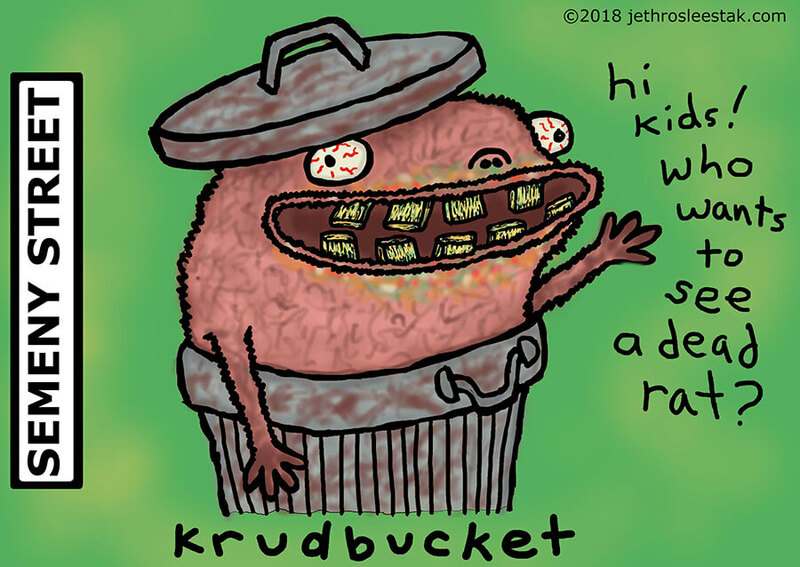 Krudbucket lives in a trash can on Semeny Street. He teaches children about the importance of cities and how they are changing for the better to make even more money for the ultra rich. Krudbucket’s song about tax breaks for pro-sports stadiums is just downright heartwarming, and the kids love it. Krudbucket also spreads drug-resistant TB and hepatitis throughout public places. It’s his way of giving back to the community, which spends over half a million dollars annually to cover all the time he spends in the emergency room, jails, and other facilities devoted to deeply troubled people who will never be capable of working a job or paying rent. For this amount of money, twenty working families could be subsidized sufficiently to live in the city, but they moved away years ago. Of course, nobody mourns their loss on Semeny Street or the influx of street addicts because that would be ableist and insensitive and judgmental and all that. Krudbucket doesn’t take his meds consistently and sometimes spends whole days and nights on end screaming at invisible demons. It’s all part of the sense of community that makes Semeny Street a special place for children to learn about our world. People are aware of the horrible diseases that they can catch from mites and ticks, but have they ever thought about all the chemicals and crap that these poor arachnids are exposed to by feeding on humans? Most people encounter the tiny mites called chiggers while camping out at hippy-shake music festivals in the summertime. 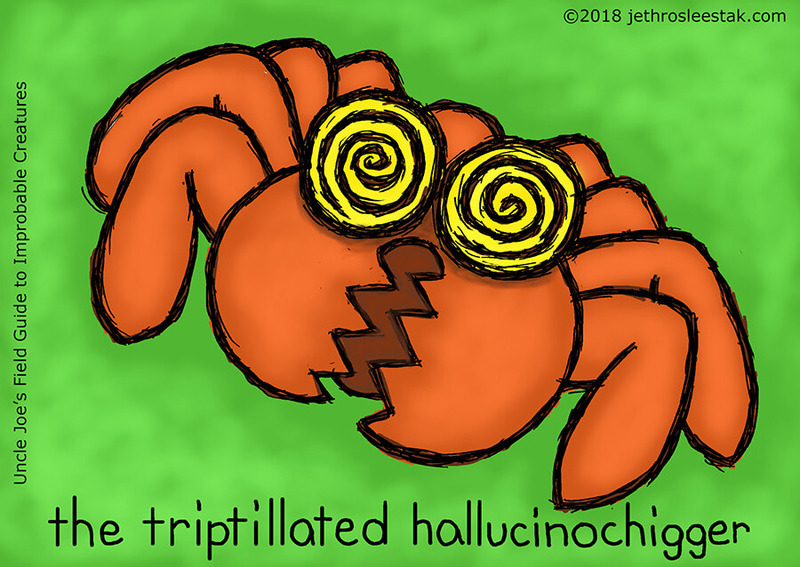 Considering how much acid, molly, shrooms, and really good THC people have in their bloodstreams at these events, it’s only natural that parasites would have to adapt to these chemicals in order to survive on the humans they encountered. 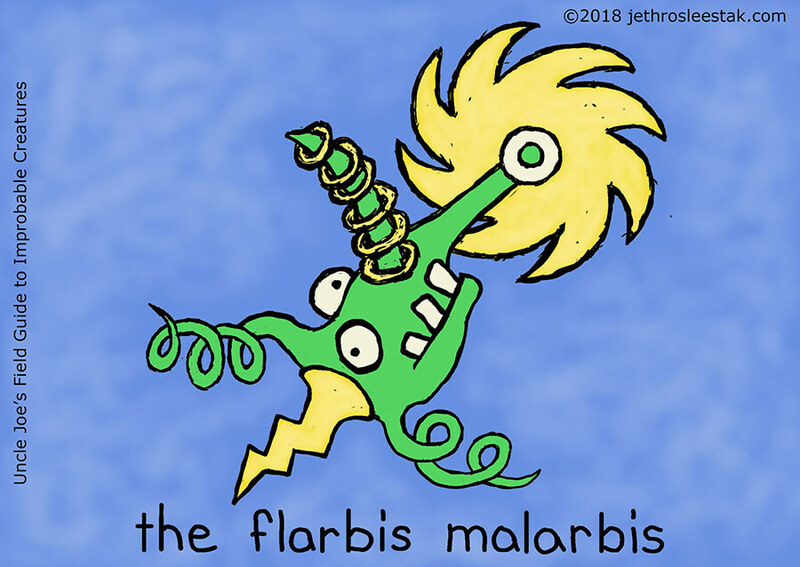 The Flarbis Malarbis is the most interesting of all the brain parasites that infest Newt Gingrich’s skull. It eats the part of the brain that normally prevents a person from behaving like a complete sociopath. Its excrement contains hormones that prevents the host from feeling shame, remorse, guilt, and other humanizing emotions. 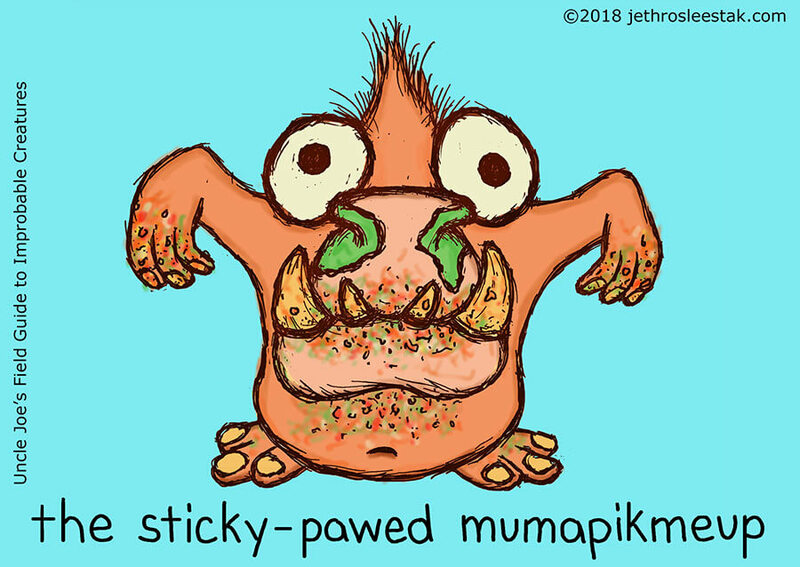 The Sticky-Pawed Mumapikmeup is the unholy creature that switches places with human toddlers in grocery stores. Their paws are coated with a mixture of snot, nacho-cheese-chip flavoring, sugary food residues, condiments, and grease. And filth. Don’t forget filth. 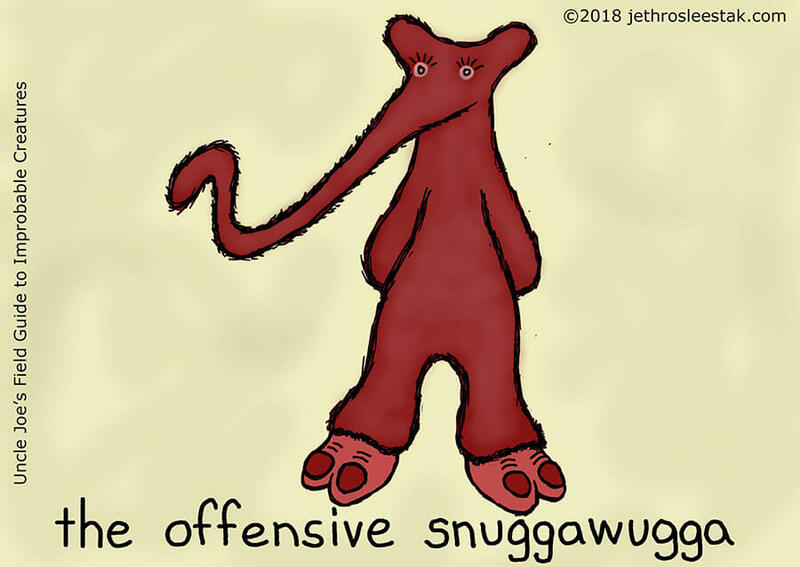 The Offensive SnuggaWugga is a living example of the importance of timing in scientific research. It was created by extra-terrestrial anthropologists to study the roller-disco subculture in Southern California in the 1970s. 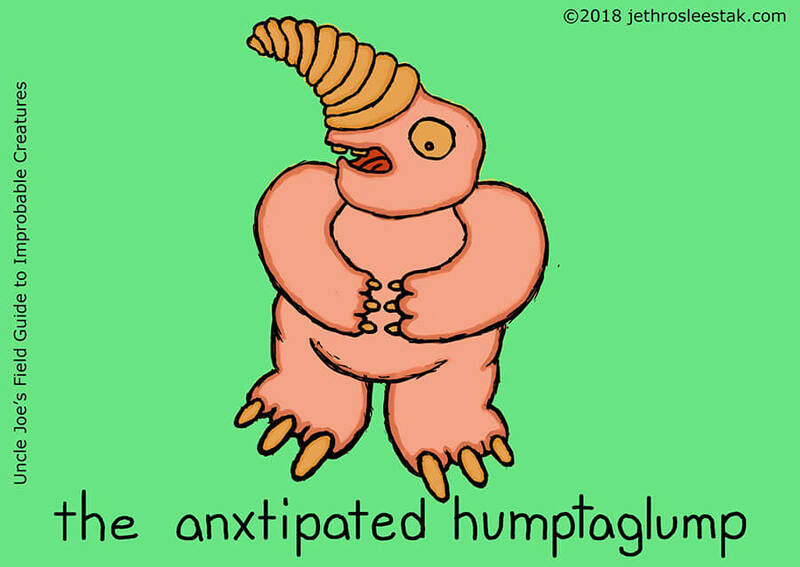 Of all the abominations created by mixing naked-mole-rat DNA with the human genome, the Anxtipated Humptaglump is probably the worst, and not merely because of its annoying habit of defecating on pets and small children. No, the worst thing about the Humptaglump is its personality. By the time of the Great Solar Event of 2043, humans were psychologically dependent on constant electronic surveillance. In 2043, the only part of a person’s life that really mattered to them was the part that was shared with digital video and available to a global audience. If a networked camera didn’t capture and upload an event, it didn’t happen, at least not in a way that was vital to the post-human psyche. Consequently, people experienced extreme psychological distress when electronic surveillance was temporarily interrupted by technical difficulties, and they could not function during emergencies, and so natural disasters claimed many more lives than in previous generations. In response, healthcare professionals encouraged people to think of their pets as the eyes of the world watching everything they said and did, figuring that irrational delusions were OK if that is what it took for people to function during natural disasters when surveillance was not available. In this role, the concept of emotional support animals experienced a renaissance. Cat and dog people argued which animal was the best watcher, and both groups made fun of people who had to rely on things like gerbils and newts. New creatures were also made for this market. 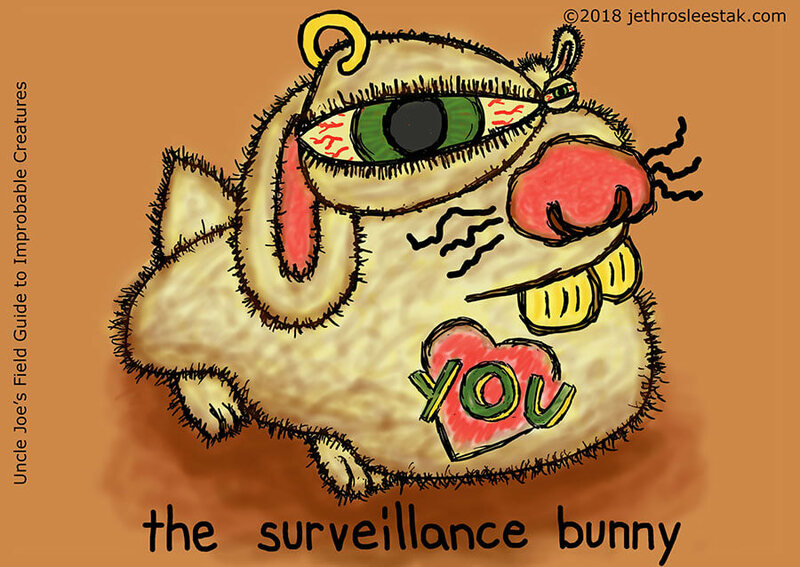 The Surveillance Bunny was genetically engineered to have one large staring eye and was marketed as a dual-purpose emergency supply on doomsday prepper websites, but not many of them were sold. 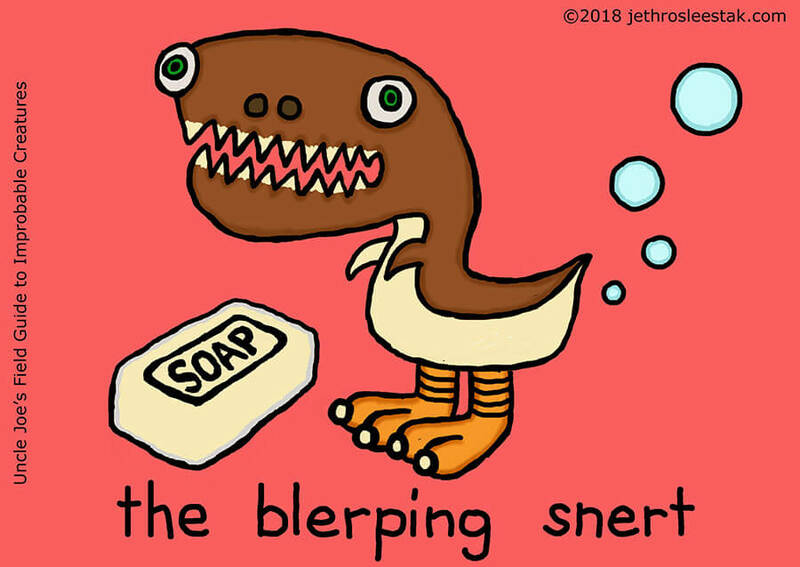 The Blerping Snert is an unlicensed GMO of unknown origin and serves no known purpose. It is odd in several ways. The creatures eats bars of soap and will eat as many as you give it, to the point that it will actually fart soap bubbles.